This aim to add Spanish began about two years ago when we met a lively woman from Madrid at a festival in town. When I learned that she now lives in Hiroshima with her Japanese husband, I asked if she would be interested in teaching Spanish to my kids—then 11 and 8—a couple of times a month. She agreed, and so began our Spanish quest. But here’s the thing: Because two lessons a month would hardly have much impact alone—in order to make more effective progress, they really had to have exposure to Spanish on a regular basis, too—I knew I would need to assume the responsibility for providing this input. The problem is, I don’t speak Spanish. In other words, I’m not only a non-native speaker of the target language; I’m a non-native, non-speaking speaker of the target language. Of course, I could learn Spanish along with them, studying on my own to fuel both my acquisition and theirs. And that was my intention from the start because I love the idea of learning Spanish, too (which would probably be a lot easier for me, a native English speaker, than Japanese has been!). Yet I confess, two years later, that I still haven’t followed through strongly enough on this good intention. While it’s true that my days are busy with various activities and obligations, I think it’s also true that I really could establish and sustain a more regular study routine—even just 15 minutes a day—if I made this a higher priority in my life. Ultimately, I think we follow through on the things that are truly important to us—things that we’ve made a higher priority—and when something isn’t made a higher priority, we tend to let ourselves off the hook too easily by claiming that “I’d like to do that, but I’m so busy.” As I get older, and now keenly see that I don’t have that many more years left to do the things I want to do in this life, I’ve become better about seizing the day and stressing action…and yet I still falter at times, and the past two years of insufficient efforts to study Spanish is a clear example. So my first important step toward more satisfying progress in Spanish—both for me and for my kids—is to finally follow through on maintaining my own study routine. And by making this declaration in today’s post, I’m hoping to hold myself more accountable. After all, when I eventually offer an update on all this, I don’t want to tell you that I’m still stuck in wishful thinking; I want to tell you, instead, that I’m now faithfully sticking to a more effective study routine. At this point, you’re probably wondering: Well, if you don’t speak Spanish, how have you been providing your kids with regular exposure to this language over the past two years? The truth is, this hasn’t been easy, not only because of my lack of language ability, but because I’m unfamiliar with resources in this language and their time for Spanish each day is limited to around 10 or 15 minutes, since Japanese and English continue to be our highest priorities. I’ve bought up just about every basic Spanish workbook I could find on Amazon, with some geared for children and others more suited to older kids or adults. These materials have been helpful, to some degree, but it’s also frustrating that there doesn’t seem to be a workbook out there that really fits our needs: a largely self-study book, for older kids, that would systematically help them develop a solid foundation in basic Spanish vocabulary and grammar. While workbooks/worksheets and digital resources make up most of the daily 10 or 15 minutes my kids spend on Spanish each day, I have a small number of CDs, too, and I play this Spanish music for them from time to time as supplemental exposure. We’re all particularly fond of the lovely bilingual Spanish-English albums by Nathalia and, more recently, have also been listening to the lively music at the Basho & Friends YouTube channel. While it’s true that Spanish is a lower priority for us than Japanese and English—and, accordingly, we’re unable to give more than a modest amount of time to it each day and the expectations for their progress are more modest as well—I think it’s also true that my efforts to nurture this third language could be made more effective, and their progress could be improved. Ideally, I’d like to strengthen and sustain their development in Spanish so that their ability in this language can grow steadily over the years of childhood, forming a firm foundation that could then be fully activated through more concentrated study, or an immersion experience, at an older age. First of all, Adam, congratulations! Your children are bilingual! Don’t be discouraged with their progress in Spanish. With two languages, your kids are primed to learn a third. It sounds as if you are doing an excellent job of consistently exposing your children to Spanish. I understand their time is limited, but you have established a routine and can build on that. You mention that your goal is for them to form “a firm foundation” they can draw on later. Have you thought specifically about what you mean by “firm foundation”? Having a clear goal will help you get there and limit the distraction of thinking about the grammar of a language you don’t speak. Of course, some basic grammar is reasonable, but I would encourage you to focus on communicative language. The ACTFL can-do statements might be helpful as you think about what your goals are. I certainly understand wanting a bigger picture, more vocabulary, and a program to give you some structure. Rather than workbooks, I would suggest a homeschool curriculum. 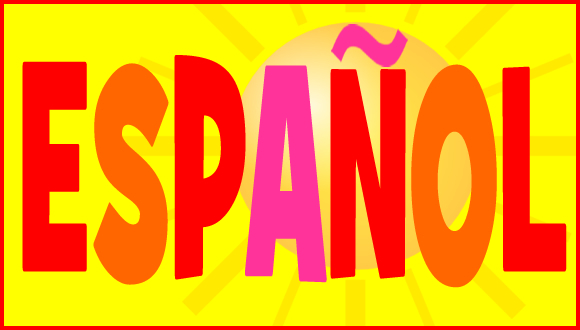 All Bilingual Press Español para chicos y grandes An Interactive Spanish Course for Children and Parents is geared toward upper elementary and middle school, and there are two levels. The website is difficult to navigate, but there are links to sample lessons on the product pages. Spanish for You is another option. It is inexpensive, available digitally, and would provide some structure. There are lots of free mini-lessons on their website, so you can see if it works for your family. For independent practice, I would also recommend Mi Mundo en Palabras, a free interactive website from the Instituto Cervantes. Kids do love apps! Your children can get valuable exposure with beginner apps that use complete sentences supported by images. Check out Stories by Gus on the Go, Endless Spanish, Feed Me (Spanish), and the oraciones option on Lingo Cat. These apps may seem below their level, but they can provide essential repetition of high-frequency vocabulary. Music is huge! You have already discovered Rockalingua, and I would suggest using YouTube to explore other artists such as Baila Baila and 123 Andrés. 123 Andrés puts the lyrics in the video description and on his website. I would add stories and books to what you are using now. Reading is by far the easiest and most effective way to expose children to vocabulary and the structure of the language. Of course, choosing books is hard when you don’t speak the language, but it is worth the effort. Look for books with audio, and ask for your teacher’s help to read to your kids and record books. I would suggest starting with TPRS novels from Fluency Matters. Brandon Brown quiere un perro, for example, would be perfect for your kids. There is a audio download of the book if your teacher isn’t available to record it. In addition, you can find many activities for the Fluency Matters books online. Be sure to check Teachers Pay Teachers. For additional books, I would suggest early readers. Early readers have a smaller range of vocabulary than picture books. They also have a close text-to-picture correspondence. The early readers on our book list will give you a place to start. At some point, when it fits their schedule, I would suggest your kids begin to keep journals in Spanish. The goal is to engage with the language in new ways that interest them. They can label pictures, record song lyrics, illustrate words or a sentence, or keep lists of language chunks they want to master. The form the journal takes is personal, so really anything goes. You have been clear your family can only dedicate a short time to Spanish, but I would encourage you to look for places to add language minutes to the day. Can they listen to music on the way to school? Can you incorporate Spanish into household chores? Short routines such as organizing for the next day, cleaning up the kitchen, or saying good night are opportunities to have the same conversation repeatedly, and that is the goal. You can find a list of common Spanish phrases to use with children here, and ask your teacher for more phrases you use on a regular basis. You can find example sentences for common household chores here. Another option is to schedule larger blocks of time periodically to provide mini-immersion experiences. You could set aside time to watch a movie in Spanish or meet your teacher in a different setting such as the zoo, grocery store, or at a park for a picnic. Be sure to take advantage of your teacher as a resource. Consider asking her to Skype, talk to your kids on the phone, send texts, or write letters. She may also know other Spanish speakers who would be willing to provide input. Again, I understand the time pressure, but even a small increase in exposure is beneficial. Finally, my best advice is to embrace the new and different role you play in their learning process. Rather than providing input, you will have to invest time in finding resources and setting up opportunities for your children. Because you don’t speak Spanish, the whole endeavor requires a leap of faith on your part. Have confidence they are learning. They are! Jenny, thanks so much for your very helpful guidance! Your good suggestions will surely help strengthen our efforts and our progress. Again, muchas gracias! How about you? 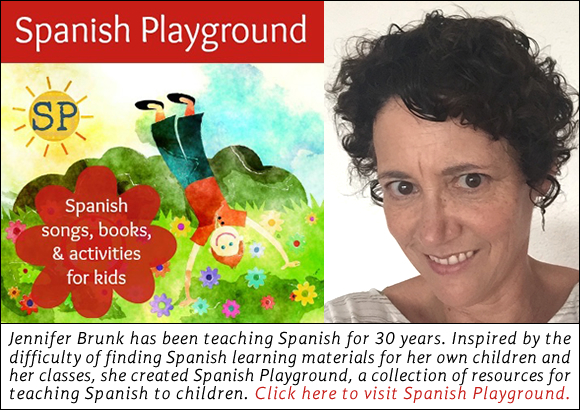 Could you add to the suggestions made by Jennifer Brunk of Spanish Playground? What other ideas or resources would you recommend for learning Spanish? Please share them below! Thank you! Audiobooks in Spanish. These can be so great for increasing kids’ exposure to Spanish with relatively little effort. Since your kids are beginners, perhaps they would like to listen to books and stories that they are already familiar with. We enjoy listening to fairy tales in Spanish, board books (such as “¿Tu mamá es una llama?”) and picture books (“¿Como dan las buenas noches los dinosaurios?” and the Clifford books are popular here). Audible.com has quite a sizable collection in Spanish; I hope that your kids will be able to find something to suit their tastes! Finally, we love any and all music by José Luis Orozco, especially because you can purchase companion books to most of his albums which include beautiful original illustrations, the lyrics (in English and Spanish) of each of his songs, and a brief description of their histories (which provides a lot of cultural context). I’m actually running a series on my blog right now to help parents learn how to best support their children’s language learning at home. I have a PhD in Spanish and am raising my sons bilingually. Perhaps you or your readers might find some of my tips useful? I’m at athomeinspanish.com. Anne, thanks so much for your helpful comment! I appreciate these suggestions and I’ll also likely be a regular at your blog: you have insightful ideas (and a super-cute family, too!). Again, I’m grateful for your expertise and I wish you all the best with your blogging and with your family’s bilingual journey! Languageguide.org is my favorite website for family language learning. It’s free, visual, and easy to navigate. You can pick from 18 different languages or dialects, including both European and Latin American (Mexican) Spanish. There are super handy exams for listening and speaking as well. When she was 7, my older daughter mastered counting to 100 in Italian in 15 minutes using the site. Great stuff for old and young alike. For music, I second Anne G.’s recommendation of Jose Luis Orozco. Many of his songs are the Spanish version of familiar children’s songs in English, which will make it fun for your kids to pick up on them. Because of your children’s ages, they might also like listening to Latin American pop music in Spanish. Shakira and Enrique Iglesias are two big artists who come to mind who have both Spanish and English versions of many of their songs. Getting the kids grooving on tunes they like, mimicking the language, trying to sing along with the tunes, looking up the lyrics together, comparing the English and Spanish versions are all great ways to passively activate their (and your) intuitive sense of the language and pronunciation. You might also get the lyrics to some of the songs they like, delete a few choice words, and then have listening tests where they try to fill in the missing word. Stuff like that. Soundtracks to movies the kids might know: Though I’m no fan of Disney, they certainly are on point when it comes to making their movies and products accessible and available in both Spanish and French. I’d recommend the soundtracks to The Jungle Book (El libro de la selva), Frozen (Una aventura congelada or El reino del hielo, depending on if you want the Latin American or Spanish version), The Little Mermaid (La sirenita), and The Lion King (El rey león), though there are others. Many you can get off of YouTube. Books: there so are so many English-language children’s books that are also available in Spanish that I think could send you a list a mile long. Ones like Strega Nona, Rainbow Fish, and Harry the Dirty Dog might be good to start with. There are always comics, as well. We love anything in the Tintin series. The language might be complex, but if your kids have the English versions they could compare segments and study the two together. Also, since Disney now owns the rights to everything Star Wars, there are a lot more Star Wars books and comics available in Spanish. All my kids love these. Magazines: try Ladybug en español. It’s for younger readers so the language is simpler, and it could be fun to study together. In my own language journey, I’m currently learning French with my kids, mostly informally, through singing and music. It’s a blast. I speak very little French so we’re truly exploring it together. We go back and forth singing and practicing our French (at the dinner table, in the car, while they’re taking a bath…), and discussing the French in Spanish, so it’s really a win-win from my perspective. Anything to increase their minority language exposure and spark their curiosity in foreign languages. That’s all I’ve got for now – hope some of this can be helpful to you. ¡Buena suerte! Lindsay, many thanks for all these great suggestions! I wasn’t even aware of the Language Guide site and it looks really helpful, and for a variety of languages. Also, it’s funny that you mentioned pop songs and Shakira because not long ago I brought home two Shakira CDs and my kids really liked the song Estoy Aqui. So I printed out the Spanish lyrics and had them practice the song, then we surprised their Spanish teacher when they sang it for her during an afternoon of karaoke! (Truth be told, I was practicing the song, too, but my kids were much better at mastering the fast parts of the song than I was!) Anyway, it was a fun success and I’d definitely like to use more pop music in my efforts to nurture their Spanish! I’ll now look into Enrique Iglesias, too, but if you (or anyone out there) would like to make further suggestions for pop music in Spanish (preferably with relatively simple lyrics), I’m all ears! Lindsay, thank you, and best of luck with the French, too! Book: Becoming a Bilingual Family by Stephen and Jeff Marks. It is geared for people who are not fluent in Spanish but want to teach their children. I also use Spanish Playground, Homeschool Curriculum Online Calico Spanish, Rockalingua, Salsa (Georgia public broadcasting, for little kids), Paka Paka (Argentina public broadcasting) and other YouTube videos (Peppa Pig in Spanish, Pica Pica). I buy Spanish books, workbooks, music whenever I find it. A lot from Amazon. I try to use these to create a Spanish environment in the home. I labeled all their drawers in Spanish, we make flash cards, etc. I ordered the Spanish magazine Let’s Find Out from Scholastic. You have to register as a teacher and there is a 10 magazine minimum order. They are not too expensive so we have extras and I reuse them throughout the year. They have magazines for older kids too. Since I am not a fluent speaker it makes more sense for our family to have “clase de Español ” 1-2 times a week which is a dedicated time to read books, do worksheets (I use Teachers Pay Teachers website a lot) and some online activities. I tend to focus on seasons, holidays, events throughout the year. My older two have gone to a local language school for Spanish classes as well. It does not always fit in our schedule but I notice a big gain when they go. We are currently investigating apps which my older two especially like but I am still trying to find one I like. Thanks for all your inspiring work, hope this helps you a little with Spanish! Best wishes for continuing success and joy! I look forward to reading more of your insights into teaching children different languages! I taught myself Spanish and I know it can sometimes seem very difficult! I’ve found it’s never too late to learn a new language! So if anyone would know someone who might find this to be a valuable and informative resource please let them know about it. Jenny, thank you for adding the link to your very helpful guide. I hope my kids and I can enjoy as much success as you have in learning Spanish.